Home / The Poster Exhibition / Paradise calling! Poster hunter Magnus Londen reveals why travel posters are enchanting. Poster hunter, founder Magnus Londen. Please, tell me what the exhibition is about? It’s all about posters – classic vintage Finnish travel posters. We want to show how these posters made Finland look great and how tourists were enticed to our Northern country. I see, but how would you define a ”travel poster”? The posters were the Internet of that time. Poster artists were commissioned to create an enticing and artistic picture of the issue “for sale”. It could be Finland as such or a city or a region. Then one would attach a brilliant slogan to the picture, e.g. Finland – Land of Romance or Finland – For Perfect Relaxation. How were the foreign tourist then attracted to travel to Finland? I think one glimpse at the posters says it all: they are fun, colourful and glamorous. Ha-haa, that’s only a cliché. The posters are almost hundred-years-old and made long before the global world of today. But still anyone can see how international our forefathers and –mothers were: There are posters in French, Swedish, German, and English, and in many other languages. I have a habit of saying that Finland has always been a cosmopolitan and open country. Hmm, I have never thought of that. Exactly! We are very full of the stereotyped picture of Finland as a closed and forgotten country. OK, but how were the tourists attracted to Finland? What were the baits? The nature. The silence. And the fact that Finland was not well-known. Finland was Off the beaten track, an undiscovered Eldorado, a wonderland. What’s so special about Finnish nature, then? Well, I suppose that one could find wilderness anywhere in the 1930’s? Not quite. Finland was regarded then – as well as today – as a genuine, as an original and untouched paradise. The cities were of course depicted as glamorous. Have a look at the Helsinki poster from 1939 for example: a lady is enjoying champagne (!) on a terrace (!) in the city centre. In fact, we must thank this wonderful Champagne Lady for giving the start-up idea for Come to Finland. It is an ordinary day, and I am in downtown Helsinki window-shopping. Suddenly I stop. In the window there is an original poster from the 1930’s: A lady sipping champagne, in the background there is a classic Helsinki-tram. This is glamour. This is peace. This is tranquillity. This is exactly how I see and want my city, Helsinki. I realize that my life has been predetermined: I am to become a poster hunter. I will find them all. 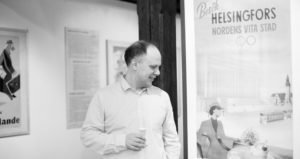 Together with my colleagues we would become the authors of the first Finnish book on travel posters. Back then we did not yet realize that the book would lead to a design company. That we one of these days would be selling products with classic Finnish travel poster themes all over the world…But still, this is where we are today. The exhibition is called ”Paradise Calling”, what’s the catch? We wanted to underline the positive and innocent arrogance of the posters. If one interprets the posters literary, Finland seems stunning and like a real paradise. We find it a bit comic and touching. On the other hand, we feel it’s nice to be somewhat cocky and boastful if one does it in a nice and innocent manner. This is exactly the kind of advertising language we love at Come to Finland. Do you have any favourites among the posters? The Champagne Lady by Jorma Suhonen will always be close to my heart. The very poster that’s shown in the exhibition is mine, it was a 40th anniversary present from my parents. Look, but please do not touch! Ha-ha! Additionally, the Ski Boy by Osmo K. Oksasen is my best friend. He has everything one needs in life: a suitcase, a pair of skis and a twinkle in his eye! Lake Saimaa – Loveliest in Finland by Paul Söderström and Göran Englund is my favourite among the summer posters. I spend my summers in the lake-area of Finland and the poster captures the atmosphere just right – calm and harmonic. What are the gems of the exhibitions? Are there any? Oh yes, quite many! The Imatra –poster by Akseli Gallen-Kallelan (as a copy in this exhibition) is the very first Finnish travel poster and a real classic. We own the original of the second oldest travel poster in Finland that dates back to ca. 1893. It advertises the boat route Helsinki/Hanko–Lübeck. The colours of this ordinary advertising poster have kept remarkably for over 130 years. There are also new posters in the exhibition, aren’t there? Quite right! We wanted to create something new, the new coming of poster art. This is why we commissioned twelve posters from contemporary Finnish artists, and we’re also arranging an international travel poster contest every year. It is very exciting to compare the old and new posters. The nature and city life attract people once again! How did the artists find the assignment? You have worked several years on the exhibition. To conclude, I must ask you: How does it feel now? As always, once you have completed a huge project, you feel happy but empty. We hope that the exhibition gives joy and understanding to the guests. These posters and artists are finally getting the attention they deserve! This is Finnish cultural heritage, but unfortunately only few are familiar with it. So come along, join us on our journey to the wonderful world of posters! Banner photo: ”Herrskap på resa i främmande stad” (in Helsinki?). 1908-1910, Bernhard Åström. Svenska litteratursällskapet i Finland, License: CC.